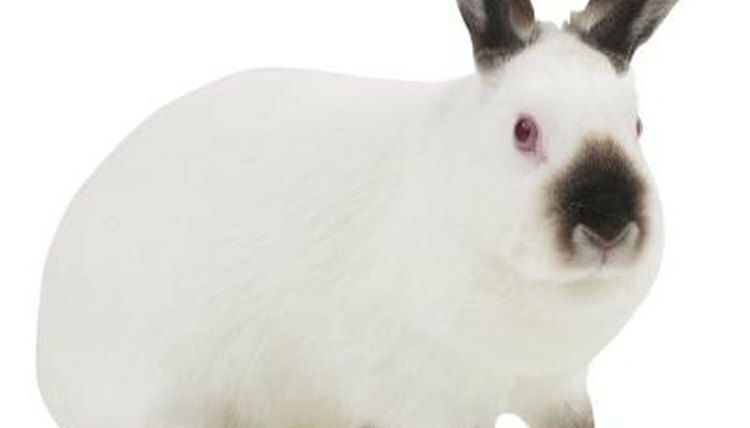 Small as your adorable pet rabbit may be, the aggressive stomping of his back feet can make a surprisingly noisy, disruptive and jarring sound. If your wee bunny stomps one or both of his hind legs down onto the ground every once in a while, he's not trying to annoy you, but instead trying to express something to you. Pay attention to your rabbit's mode of communication. If your rabbit is loudly thumping his back leg over and over, he could be trying to courteously alert you -- along with everyone else in your home -- of any impending threat that he perceives. If your bunny heard an unusual noise coming from outdoors, for example, he may be trying to warn you beforehand. He may just be worried and scared that predators are on the way. Back leg stomping can also signify irritation in the rabbit world. If your rabbit is feeling irked about something, whether it's your stroking his back for a little longer than he wants or the presence of your rather hyper dog right outside of his cage, he may make it known by thumping his feet. This behavior is a sign that your bunny is feeling somewhat irritated or uneasy at the moment, and probably just needs to be left alone for a little while. Although rabbits are generally docile creatures, they're in no way immune to occasional fits of anger. A rabbit may express feelings of belligerence and hostility by stomping his back feet. If your bunny is in this foul mood, give him some much-needed time to cool off. Leave him be temporarily. If your rabbit is feeling particularly energetic, lively and hyper, he may even stomp his back leg as a precursor to running around. By doing this, he's trying to get your attention and impress you. "Hey there, look at me. Do you see just how rapidly I can run?" All your rabbit is asking for is just a little bit of your concentration.